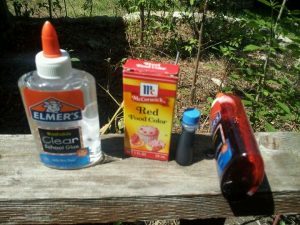 Using Washable Elmer’s Clear School glue, comes in a 5 oz bottle. Unless you loose your mind and purchase a gallon somewhere! I would have put this on Pinterest BUT AS USUAL, the link is just photos of links that really go NOWHERE. REALLY PEOPLE!?!? Take the time to find the real link and link to that, not linking to other’s Pinterest sites. And just like any web page go check it again and again –BECAUSE THIS STUFF GOES AWAY! — YOU SAVED NOTHING!!! Mix well. Dries shiny and is vaguely water-resistant. Varnish if you need it water-proofed. It is Washable glue so it will wash away in washer, laundering, and rain. Previous Previous post: WTF, roller skates?